Once upon a time, long long ago, I read in an English decorating book that corners were often neglected. 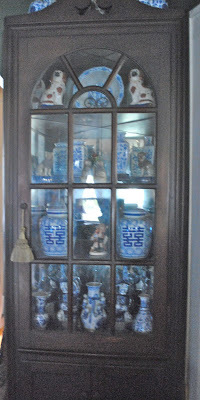 The author's solution -- a corner cabinet filled with bits and pieces of blue and white china. 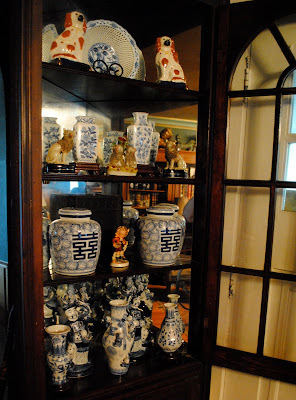 At an auction, there was a nice corner cabinet -- a bit primitive and perhaps handmade. 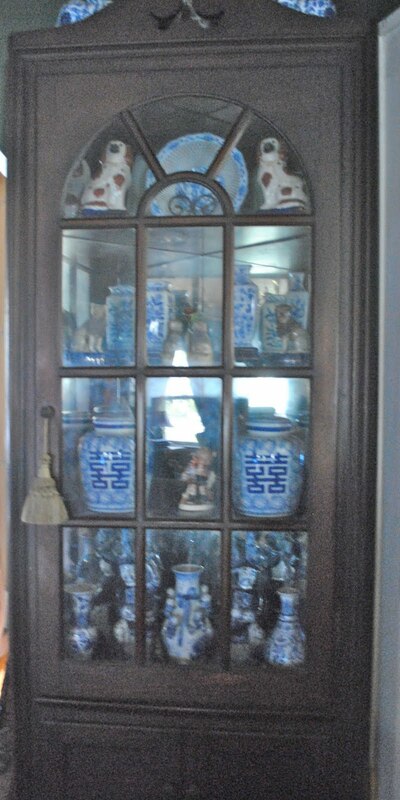 We added mirror to the back of the cabinet and filled with with bits and pieces of blue and white china. It fits in the corner of the living room -- behind the front door and definitely brightens that corner! 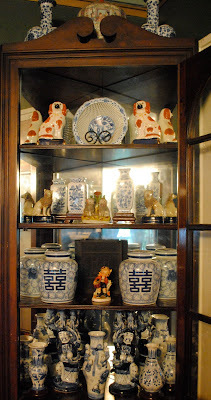 Four nice shelves -- none too tall and below two more which hold my hyacinth vases and daffodil bowls. 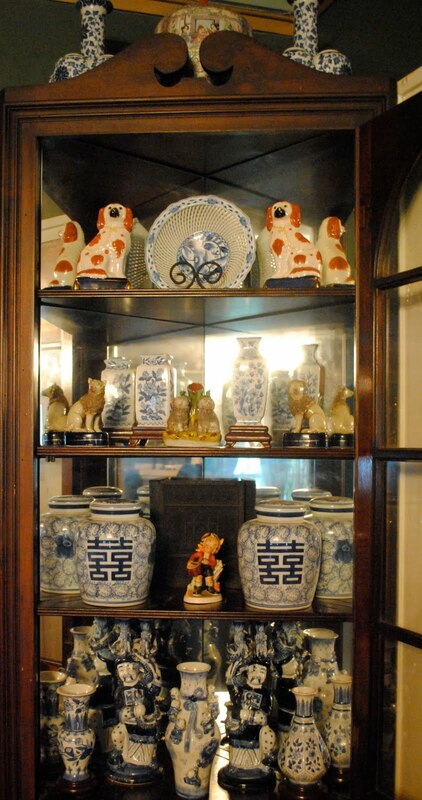 A few pieces of my Staffordshire are placed amongst the blue and white and one lone Hummel. It does have a lovely door with a nice detail. It does brighten that corner and of course, anything blue and white always brings a smile to my face. It's Monday which means that it's Blue Monday -- so please join Smiling Sally to see other blues this Monday! It's a beautiful way to fill a corner! I have a corner cabinet in my living room, but I never reattached the doors after we painted it. But now I"m thinking we might need to. Your corner cabinet is beautiful. The contents of blue and white pieces are just stunning. What a gorgeous piece of furniture. Happy Blue Monday. 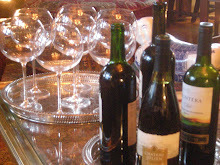 What a wonderful cabinet - and the contents are fabulous. Loving all the blue and white (of course! )as as have lived in Staffordshire all my life....the figures are fabulous too! What a beautiful way to bring life to a dark corner. Your blue and white pieces are lovely. What a find! The corner cabinet is a lovely way to store and display your blue and white pieces. 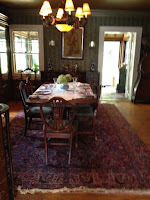 We have a built in buffet in the dining room that I am constantly trying to make utile and attractive. 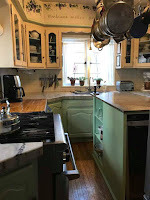 I love corner cabinets...this one is very pretty with all your lovely things inside. 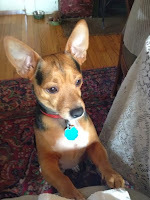 Often times, not having a corner cabinet, I sit a piece of furniture katty-cornered, if there's room. I love the idea of placing a mirror in the back, thereby doubling all of your gorgeous blue and white treasures. Yes all the time the corner is almost forgotten. Like your cabinet and we almost have the same post. Happy Monday! Gorgeous cabinet to hold your collectibles. Love the blues and whites. Happy Blue Monday!